The flier’s evidence — in fine print — is Adams’ record in the Florida legislature. As a state representative, she voted to approve two state budgets, which contained federal stimulus money. By that measure, Obama counted on nearly every Republican in the Florida statehouse. The budgets passed along party lines. And most Democrats opposed the spending plans. The congressman behind the mailer is Rep. John Mica, a 10-term representative who voted against the stimulus in 2009. 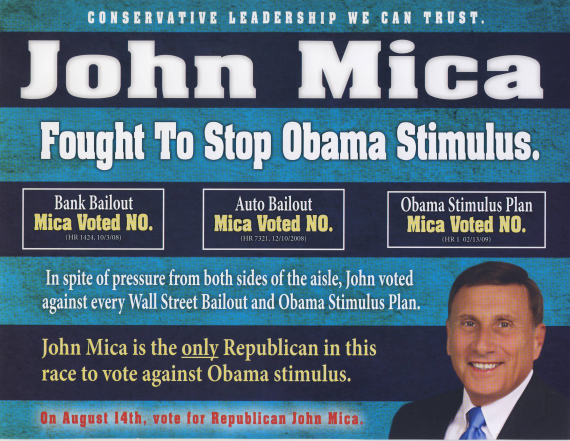 Mica’s mailer misleadingly claims he’s the only Republican in the two-way race to vote against the stimulus. He’s the only one who had a chance. Using Mica’s logic, perhaps Obama counted on him, too. After Obama signed the American Recovery and Reinvestment Act of 2009, Mica urged the federal government to hasten the distribution of funds to Florida. He also praised a portion of the act. Our thanks to Burton “Bud” Gotshall of Casselberry, Fla., who uploaded the mailer to our Spin Detectors website, through which we ask our readers to help us monitor political claims and campaigns across the country. Gotshall, a registered Republican, said the redistricting and ensuing primary battle prompted him to closely examine the mailer for spin. He said he supports Adams. Adams and Mica are squaring off in the newly redrawn 7th congressional district, which is north of Orlando and represents 51 percent of Adams’ constituents and 42 percent of Mica’s. The race ahead of the Aug. 14 primary has assumed the narrative of established Republican versus tea-party member. Mica chairs the House Transportation and Infrastructure Committee and has spent 20 years in Congress. Adams is a former deputy sheriff who spent eight years as a state representative before arriving in Washington. She recently earned Sarah Palin’s endorsement. In fine print, the mailer cites the numbers of two appropriations bills the Florida legislature passed in 2009 and 2010. Those bills encompassed Florida’s entire state budget, a fraction of which contained stimulus money. In May 2009, Florida lawmakers passed a $66.5 billion spending plan. It included $5.5 billion in stimulus money. Most of it funded education and health care programs (see page 52). Florida faced a $6 billion shortfall that year. Republican lawmakers pushed through the budget by balancing it with stimulus funds, gambling money and increased fees and taxes. Most Democratic state lawmakers voted against the spending plan, calling it inadequate. For instance, one Democratic senator said the budget failed to spend enough on health care. Adams voted to approve the budget — as did every other Republican in Florida’s legislature, except for one GOP state senator. She opposed the use of gambling money. A similar scenario played out in 2010. Adams and most of her fellow Republicans voted “yes” to successfully pass a spending plan that most Democrats opposed. The budget included $2.5 billion in stimulus funds, most of which the state spent on education and health care programs (see page 47). 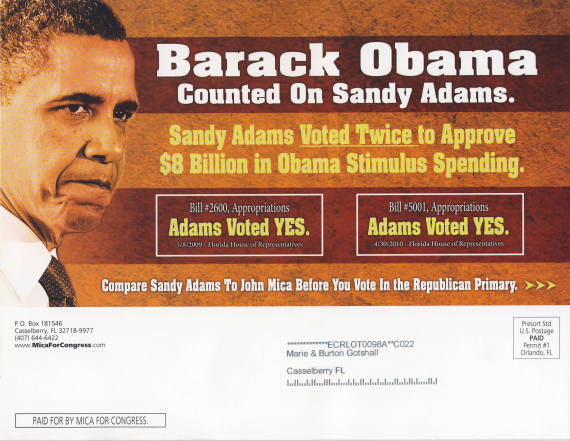 If Obama “counted on” Adams to approve stimulus spending as the mailer claims, then he counted on almost every Republican state lawmaker in Tallahassee. And for that matter, he counted on many state lawmakers — including Republicans — across the country. It’s true that some Republican state lawmakers rejected some stimulus money. For instance, Alabama and Mississippi, turned down federal funding for unemployment. And congressional Republicans criticized the use of temporary stimulus money to balance state budgets when it would only dry up in a couple of years. But many governors and state lawmakers approved the use of stimulus money the way Florida did. The National Conference of State Legislatures surveyed 35 states and found that 25 used stimulus funds to help balance their budgets. Virginia Gov. Bob McDonnell, a Republican and Mitt Romney surrogate, recently said the stimulus helped Virginia balance its budget, although he said the money won’t help out in the long run. The mailer’s flip side misleadingly claims Mica was the only Republican in the race to vote against the stimulus. He was the only one who had a chance. Adams — the only other Republican on the primary ballot — was still in the Florida statehouse. It’s true that Mica voted against the stimulus in February 2009. But, like Adams, Mica made sure the money benefited Florida. Mica also cosigned a letter with 17 members of Florida’s congressional delegation, which included Republicans and Democrats, asking the federal government to grant a waiver giving them access to stimulus money. And that July, he spoke on the House floor to lament the slow slow release of the stimulus funds. John Mica, July 28, 2009: Where are the jobs? Congress passed a $787 billion so-called stimulus package. I took to the floor and spoke from the Democrat side of the aisle and pleaded with folks that we needed jobs and we needed to invest in America’s infrastructure. Instead, we put less than 7 percent. So, to date, out of $787 billion and $48 billion for transportation highway money, we have $523 million expended.